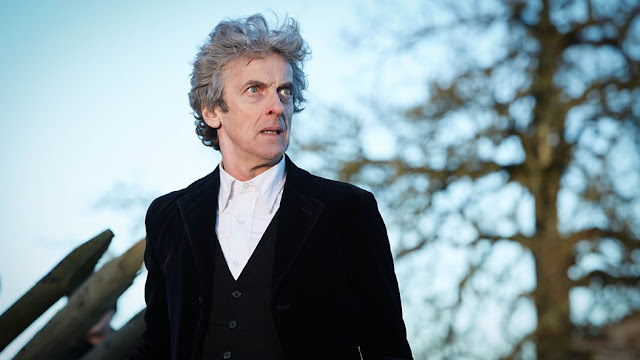 S10E12 - "The Doctor Falls"
It's tough not to be filled with disappointment that we lose Peter Capaldi after just one more episode, but he can be confident that he's ending on a high. I've expressed frustration that series 10 hasn't allowed him to demonstrate his real talents, but these last few weeks have fulfilled my wishes. This is the Doctor that became my favourite back in series 9: the one who brokered a peace treaty between humans and Zygons; the one who calmed a scared young child and inspired the rest of his future; the one who caused unimaginable grief and pain to a Viking girl who only ever wanted to help. Capaldi's Doctor is a flawed individual - he makes mistakes a lot - but that's what makes him the most interesting version of the character that new Doctor Who has offered so far. Peter Capaldi has been crafting his legacy since series 9, but here he completed it. "The Doctor Falls" is really an episode of standout performances. Michelle Gomez is notably more subdued here than usual, but that makes sense when she stands beside John Simm's Master - an unhinged, borderline psychotic character this time around, and probably the best version of Simm's Master we've seen. Missy's potential "turning good" has been a lingering thread all season, and "The Doctor Falls" concludes the arc in ways both smart and devastating. Missy does indeed "turn good", but the only person to stop her from letting the Doctor know this? The old version of herself. It's a brilliantly clever way of completing Missy's season-long arc without sacrificing the very core of the character. I highly doubt we'll see any version of the Master for a long time now, but "The Doctor Falls" is a perfect way to leave the character. It's always nice when the finale is the best episode of the season, I'm not sure that's ever happened for Doctor Who before this one. Series 5's "The Big Bang" comes close, I'm not sure if "The Pandorica Opens" just edges it out. Missy and the Master's sexual tension was weird. Just plain weird. But so are they, I guess. Gomez and Simm played it wonderfully. I didn't get to talk much about Nardole in the review, so here goes. At his core Nardole is essentially little more than a lovable child, but the season has done a stellar job of adding depth to him, demonstrating his intelligence and his courage. For him to leave with the town of Floor 507 and act as their guardian is simply brilliant. Matt Lucas has been great fun all series, but he made his final moments really hit home tonight. Genuinely affecting stuff. Capaldi's solo moment in the TARDIS in the final scene was beautifully realised. His magnum opus for Doctor Who remains "Heaven Sent", so it was nice for him to get one more big, showstopping solo piece before his final series wraps up. Again, legacy. I really nope Rachel Talalay stays on as a director into the Chibnall era. The scale she brings to this episode is breathtaking, but the softer moments never lack heart or soul in their appearance. Without a shadow of a doubt, she is the most impressive director Doctor Who has ever had. Well, that's it for another year! Thanks to everyone and anyone who's read one or two or maybe even all of these reviews. I'll be back with an episode ranking in a few weeks time once I've processed everything and maybe re-watched some of the earlier episodes, and then it's straight on through to Christmas for a multi-Doctor episode. How exciting! Well no we're saying goodbye to Peter Capaldi so it isn't exciting at all really. Is it too late to convince him to stay?